When I first started food blogging I had this idea to make it a project solely dedicated to chocolate chip cookies. All of the things that can be made with them or inspired by them. At the time it was more of a joke then anything else, but now I am thinking it should seriously have been considered as a possibility. Maybe something for a future post series???? One of the only negatives to the idea was that I couldn’t help feeling like it would make me and all of my cookie eaters get tired of them, and that would be unspeakably tragic. Obviously this would take a lot of chocolate chip cookies to happen, but I’ve been blogging for a long time and who knows how long I’ll continue. We’d probably be sick of them by now and if not we’d be close. Plus, I don’t know if I could have contained myself to just one theme all this time. I mean, you have probably noticed by now that I am unpredictable in my food whims, to say the least. It just seems unlikely. But just because I am not doing a CCC (chocolate chip cookie) blog doesn’t mean I can’t still bombard you with a ton of them as often as I deem necessary, right? 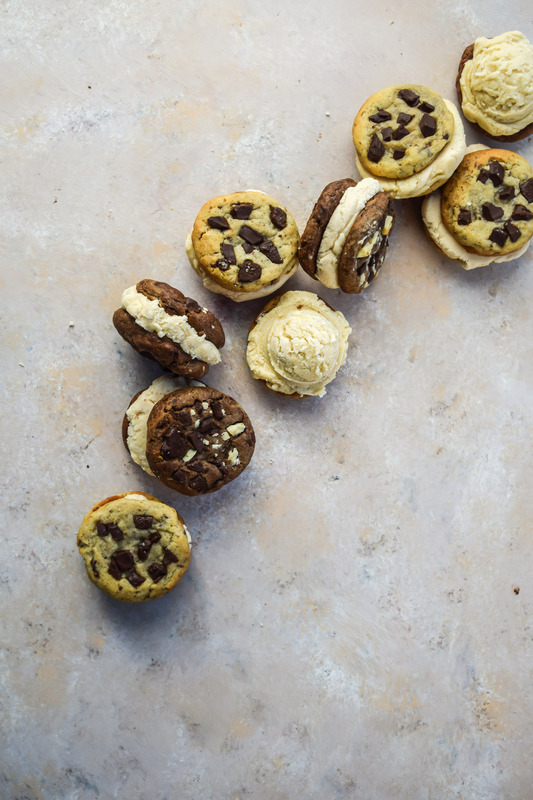 Like really, who could complain about too many chocolate chip cookie variations? Some of my family think I should do a weekly post series for them and I kind of like that idea, that I could definitely work with. What do you think? So, these are one of the simplest things ever I had two perfectly beautiful batches of chocolate chip and Death by chocolate cookies that were begging to be my subjects and some extra vanilla ice cream to go with so is was perfect. 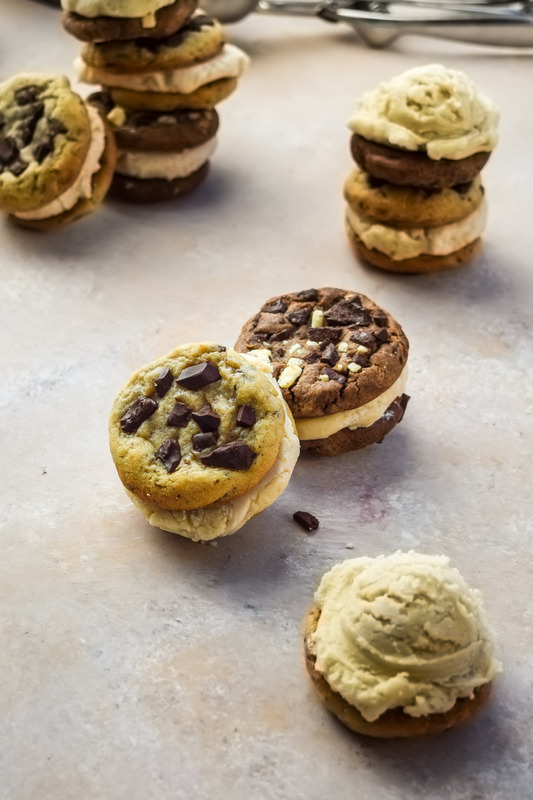 You can make your own ice cream or just use a good quality one from the store, and if you don’t have the time to try both cookie flavors then just do one. 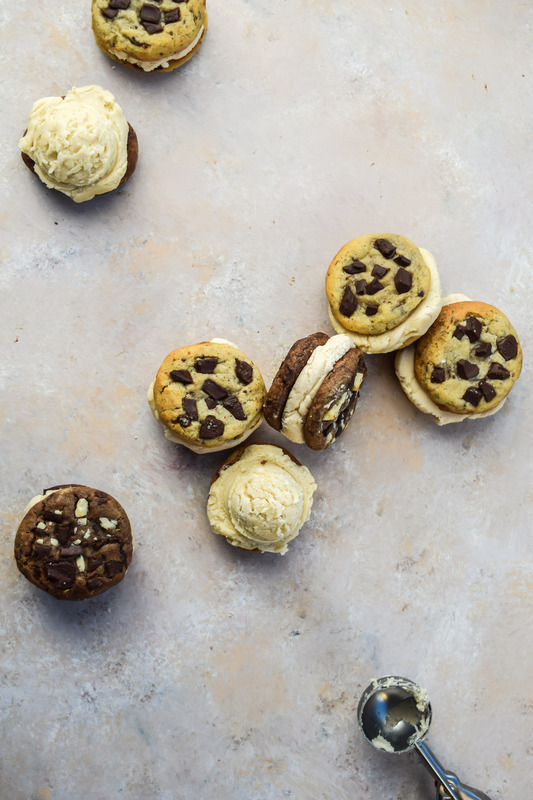 Or better yet, try a different one like cinnamon roll cookies or the brown butter chocolate chip cookies! I’m only here to inspire you will deliciousness. ALL CONTENT IS MINE AND ORIGINAL! All of these food photos were taken with my Nikon D5300 and my favorite Lens, the Nikon AF-S FX NIKKOR 50mm f/1.8G. You can find out more in my INTRO POST. Oh, and don't forget to follow me on all your favorite social media channels! 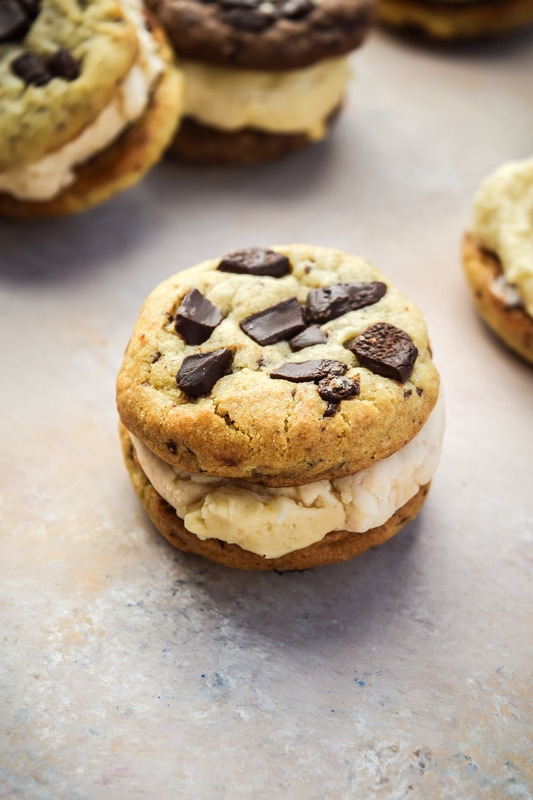 Recipe available upon request to the first Steemian friend who says today's words : "I scream for ice cream!" Looking delicious. "I scream for ice cream!" Pre-heat oven to 350 degrees F (180 C). Cream butter and sugars together in bowl of stand mixer (or with hand mixer). Scrape sides of bowl and add eggs; beat until well combined. Add vanilla, soda, and salt. Add flour one cup at a time and beat after each addition. (If you are using a hand mixer you may have to hand stir the last cup of flour into the dough.) Stir in chocolate and line a cookie sheet with parchment. Oh, so sweet of you @itsallasong, thanks! I just love chocolate chip cookies loved it....it looks sooo delicious and yummy perfect with tea and coffee.....loved the photography it's amazing gringalucious thank you for sharing with us. I just love to share @universalpro! Thanks for reading! Looks yummy please put them in my tummy. i was eating some local biscuits . yeah i like it alot dear ..
when are you sharing more ? I just woke up from bed now and the first thing I saw on steemit here is chocolate chip cookies, wow!! This is going to make my day, thanks for sharing and also keep it coming. Haha, well that's always a great way to wake up I think @olatun! Thanks! Am dieing over here for this delicious stuff, wow you are really good, how can I make this? Am upvoting immediately. Must show these sweeties to mum:) They make me feel hungry..
Well I definitely agree @canadianrenegade! Thanks for reading! I appreciate it @belin! Thanks! I love to share them @gvincentjosephm ! Thanks for your comment! 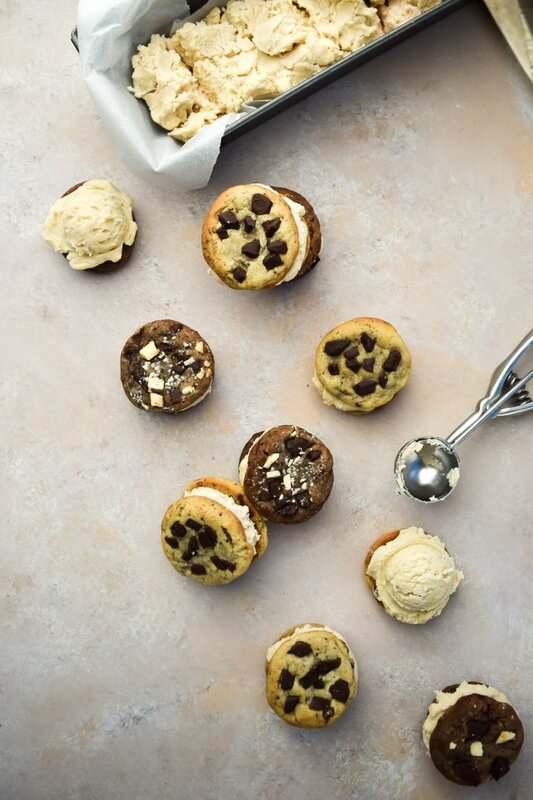 Chocolate chip cookies and ice cream, what else could be better, nothing hahaha Looks so very delicious! Oh my, I want this! I couldn't agree more @rodznocturne! Thanks for your support! So glad you liked it @folly-pandy! Vary nice food photo shoot @gringalicious. Photographs are beautifully taken. 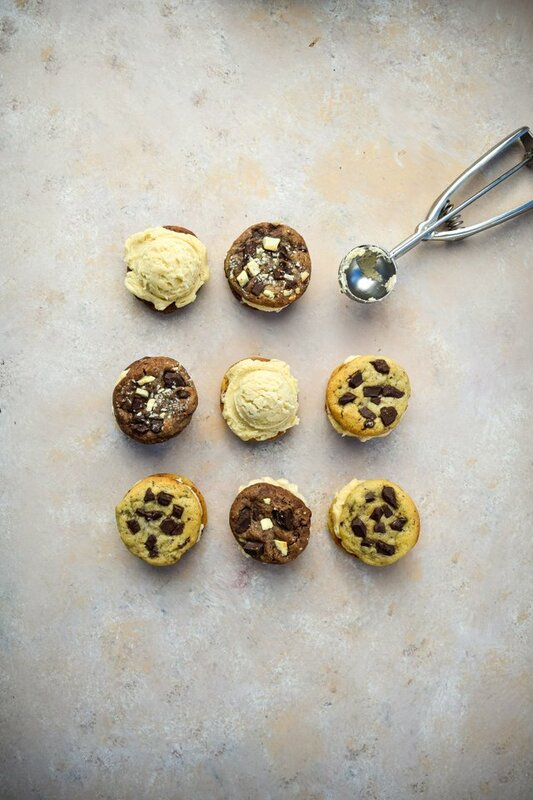 chocolate chip cookies are looking delicious. Thanks for sharing. will show my wife this ! I hope you convince her to make them for you @jamesmiller, haha! Very happy you liked it @lifeofdarlington! damn, product pic well taken, lighting was great, colorization tip top. nice! Am on it right away. Thanks a lot. Hehe, well I hope you enjoy @mrxplicit! I definitely know it's gonna take as it looks. those pictures really look delicious . I'm loving it. wow!!!! what a photograpy is...i like this recipe..in my life i ate this food sometimes.. I'm so excited that you like it @riyad11! You got a 3.70% upvote from @postpromoter courtesy of @gringalicious! Want to promote your posts too? Check out the Steem Bot Tracker website for more info. If you would like to support development of @postpromoter and the bot tracker please vote for @yabapmatt for witness! Doble delicia: las fotos y el entretenido post. I wish you could make simpler recipes! Meanwhile, successful cooking is also very successful in photography. light, design everything is great. Oh my goodness... these look delightful!! So cool that you made your own ice cream for them! That's so sweet of you @coruscate! I'm so happy you like them! Thank you @gringalicious for making a transfer to me for an upvote of 3.17% on this post! Half of your bid goes to @budgets which funds growth projects for Steem like our top 25 posts on Steem! The other half helps holders of Steem power earn about 60% APR on a delegation to me! For help, will you please visit https://jerrybanfield.com/contact/ because I check my discord server daily? To learn more about Steem, will you please use http://steem.guide/ because this URL forwards to my most recently updated complete Steem tutorial? The ice cream dont seems to get melt.. Amazing:)! Skipped all the text (sorry!). Just wanted to see the next photo as each one looks as delicious as the last! Love the second photo, well done! That is perfectly fine with me if you skip the text, especially if you going to leave a great comment. Some day, maybe, I'll start shipping but probably only in the states. International shipping is a bear. By the time it gets here, the ice-cream would have been melted! Then we would have extra soft-baked cookies. They look so delicious. And the food photography is magnificent. Yumm! Oh, thank you so much @emilevil! Oh! What I wouldn't give just to have a bit of those little heaven's delight. Now I'm hungry! Hehe, well then I've done my job @jamesanity06! 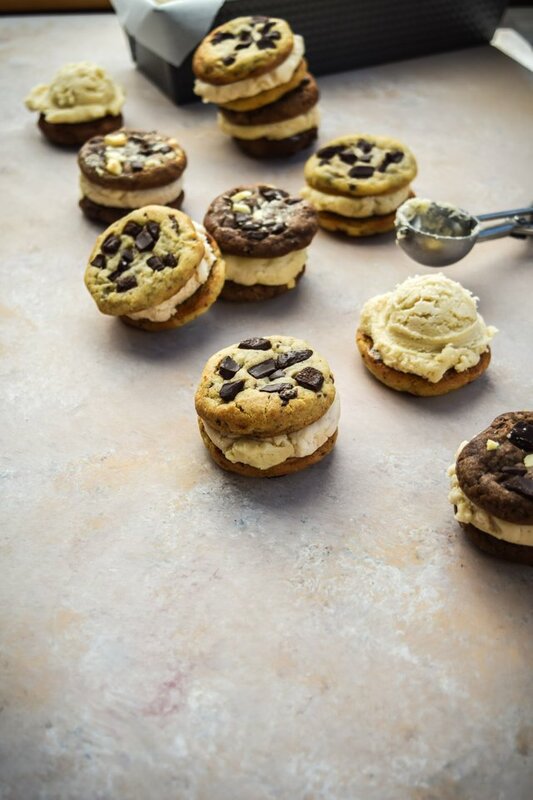 Cookies with ice cream. Perfect combination..
You got a 5.14% upvote from @ipromote courtesy of @gringalicious! I have never seen these biscuits sold in the local store at Borneo. It's look delicious. Thanks for sharing. Oh, thank you so much for reading the post @trydaily! They look so good! Have you ever tried with M&M cookies...awesome also! Looks amazing! I want to eat all the cookies! I made cookies today too! You can see in my today post. Check if you want too. I will appreciate your feedback! Thanks @paulawonders. I will do my best to get by your post and give some feedback. I already gave it an upvote. Have a great day! Wow! These looks so nice my friend! 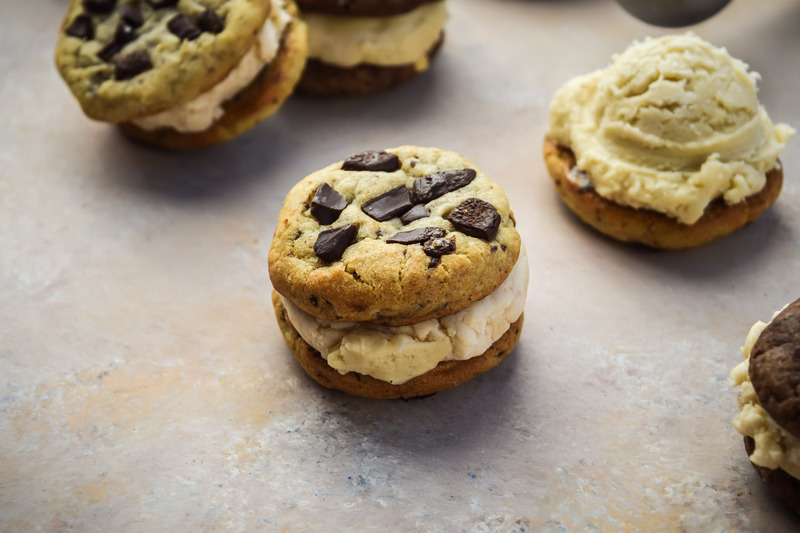 Good idea to prepare the cookies and you make the ice cream inside , I love them so much, I know that you are specialist of cookies. ah, as always, such sweet and supportive commenting, thanks so much @creativewoman!! These look amazing. I love the giant chocolate chunks. Awesome photos too! Thanks so much, Dan. Wow, 3 minutes of staring, you don't have time for that. You have like 1500 more comments to make before the day is out. You're a commenting phenom and I appreciate every one that I get. Thanks so much for your continued support my friend. The weather is so nice here. Looking forward to hearing about your San Diego plans. Looks so delicious! :D Congrats, @gringalicious! Oh yes it does @josiahebighe! Thanks! I was already hungry dang it. Also I'm terrible at making food (every kind) but I'm defiantly trying these when I get the chance. Thank u! A blog dedicated to CCC? Lol. It's possible. So many types and categories to go through and there will always be some sort of audience. I'd be more worried about you getting tired of them. Personally, as a creative, I follow whatever gets my attention until it no longer keeps my attention. You might treat this project the same way :) Do it until you don't feel like doing it anymore, then just evolve it into something else. Best of luck in your journey! Congratulations @gringalicious, this post is the ninth most rewarded post (based on pending payouts) in the last 12 hours written by a Superhero or Legend account holder (accounts hold greater than 100 Mega Vests). The total number of posts by Superhero and Legend account holders during this period was 28 and the total pending payments to posts in these categories was $3038.88. To see the full list of highest paid posts across all accounts categories, click here.